There are a lot of armchair historians out there these days…which, don’t get me wrong, I think is a good thing. For one thing, it may mean that the publishers who seem to have given up on publishing history in favour of celebrity drool-fests might rethink their strategy and go back to publishing works by the likes of Charles Esdaile, Dominic Lieven, Andrew Roberts, Michael Broers and all these other fabulous authors I admire. And that wouldn’t just be a good thing, it would be a grand and noble and enriching thing. Yet it often also means another thing, and that is, everybody’s got an opinion on everything. No matter how small, somebody’s going to give it to you when your views don’t match theirs. You might think it’s of no import, and quite possibly, you’d be right. Does it matter? Did it lead to anyone’s death, to an epidemic of disease, to the cure of a disease, to war, to peace, to the emancipation of women or slaves? And the answer is, of course, none of the above. Nevertheless, a lot of folks get very miffy over it–insisting that it could not ever, ever, ever be mentioned in a book that was set earlier than 1815-1816. So I was chatting about this dilemma to another historian, one whom I respect enormously as much for her knowledge as for her ability to approach problems from different angles. And after recounting the adamant position of those who held that it was unknown here until the Lievens introduced it in the late autumn of 1812 (he was the Russian ambassador), and discussing with her the various historical references I had to hand, including engravings of waltzing couples published well before 1812, she said something quite interesting. Is that a stroke of genius or what? Of course, she’s right. And it was at that point that things started to get very interesting. Because the first publication of music for the waltz was in 1806. 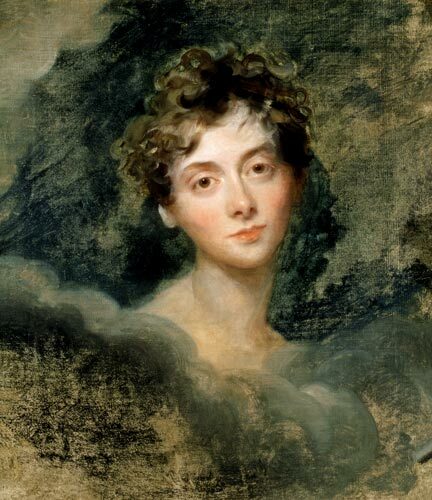 A not-well-known-to-us English composer, Edward Jones, published A Selection of Original German Waltzes, and dedicated the volume of music to none other than the Princess Charlotte (who was only ten at the time). Anyway, this novel approach to searching out the music led me to a number of quite fascinating bijou fact-ettes about the waltz, all of which kind of overturn the idea that this ‘shocking’ dance erupted on the scene out of nowhere in about 1814-15. In 1810, Gillray published his famous caricature of waltzing couples, entitled, Le bon Genre. And finally, there’s this lovely bit of insight into Viscount Castlereagh’s personality–that’s the Foreign Secretary, in case you’d forgot, with the wife who’s allegedly a stodgy great stickler for manners and morals as well as a Patroness of Almack’s. Nevertheless, by 1815, because he loved it so much, there was even a waltz dedicated to him, with the title, Lord Castlereagh’s Waltz. 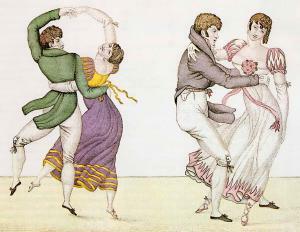 And the most famous dancing master of the age, Thomas Wilson, supplied not one, but two versions of this dance in his immensely popular volume, Le Sylph, An Elegant Collection of Twenty Four Country Dances published in 1815. All of which evidence suggests to me that the waltz–not the one we know (and I’ll get to that in a minute)–was well and truly a fixture on the dance floor long before it was allowed at Almack’s. Though even that date has to be fixed no later than June 1814, because Tsar Alexander was here for a few weeks’ visit then, and we know he loved to waltz (whether it was that he loved the dance or he loved the opportunity to get handsy, I can’t tell you), but I just can’t see anyone saying “no” to him–not even at Almack’s, where he assuredly went. 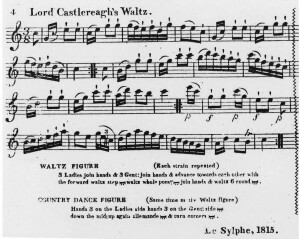 Which led me to examine the issue even more closely…one reference I found to it in 1802, spoke of the waltz as but one of a medley of elements making up the series of country dances…so lots of people were learning it and dancing it, they just didn’t necessarily have a separate designation for it. “It began with the ‘March’ which was a very brief side by side promenade. This turned quickly into the ‘Pirouette” or ‘Slow Waltz’. The partners would take each other in one of several holds, one of the more popular of which had the partners facing in opposite directions, hip to hip, with one arm across the front of the partner’s body and the other hands holding in an arch above the body. In this posture, they would rotate very slowly, with their gaze fixed on one another. This was the part that probably made the blue stockings the most nervous. “The next was the ‘Sauteuse’. At this point, the dance got a bit more energetic, with the music tempo increasing and the dancers working a little hop into the step. The posture would be changed – one possible option would be the man holding both the lady’s hands behind her back. So there you have it. It wasn’t as I thought. It wasn’t what anyone I’d spoken to previously thought. It was a twisty, turning tale of some were, some weren’t, some knew, some didn’t, here a little, there not so much…just like all history, really. Not at all clear-cut…In fact, messy as a pig’s breakfast. 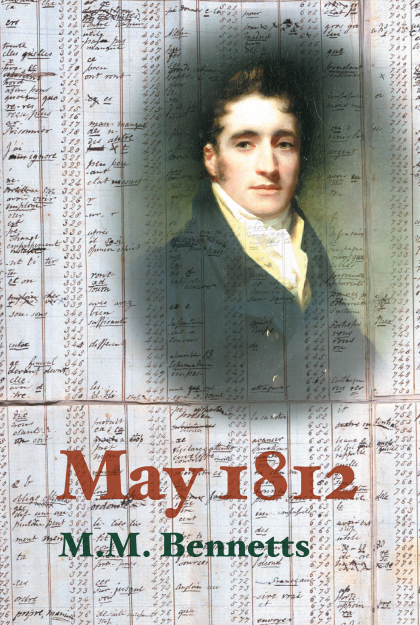 This entry was posted in Did You Know?, History, Music and tagged 1812, Castlereagh, History, May 1812, Music, Regency society. ‘…get all handsy…’ and ‘…messy as a pig’s breakfast…’ by far the funniest snippets in this brilliant post. Really enjoyed this, especially as we had been discussing it (though I wasn’t so clever as to think of the sheet music 😉 ). I can’t believe that it spoken about as early as 1806 – who’d have thought – but I quite agree with you – not so clear-cut – a fact all of us have to remember about history! It’s appearing in sets of country dances, as a segment of these, as early as 1802…so the whole thing is obviously in a process of evolution, from being a waltz interval as it were, to over the years becoming a main event by itself. This is fantastic, M.M.! Thank you for this information. It never made sense to think of a dance just popping into mass consciousness based on a single introduction. Most things do seem to evolve over time, after all. A most enjoyable post. Well, for me, Lauren, there was always the problem with the dates not fitting. Yes, the Lievens came in the autumn of 1812, but I knew I’d seen it mentioned in earlier somethings or others as well as in earlier cartoons…plus, we also had diplomats who were posted to the European courts before 1814, so were we to assume they lived like hermits and did not dance and said nothing about what was happening on the Continent? What fascinated me was the waltz being a part of regularly performed country dances as early as 1802…which would mean that the Lievens were building on a foundation already laid. Absolutely fascinating article about the history of that scandalous pastime, the waltz (turns out it was kind of scandalous)! Wow! Thank you. And so pleased you enjoyed it. When I found myself chatting to my husband about it, I figured I should spread it more widely! Ah, yus yus. This is on’e favourite Waltz. Just missing a drum solo by Keith Moon at the end. Excellent post, mercy buckets! Stephen Storace’s comic opera of 1792, The Pirates, was produced at Drury Lane Theatre, London. It contains a sequence of four dances/instrumental numbers in Act 2 (pages 54-5 of the 1792 vocal score), of which the second is described as a Waltz (Allegretto, in 3/8 time). This opera was very popular, and regularly revived. Storace himself died in 1796.